In this car, Public Enemy #1 was untouchable! He could afford the best. And that's what he drove. The most infamous criminal of all, Al Capone drove a luxurious and powerful 1930 Cadillac® V-16 Imperial Sedan. 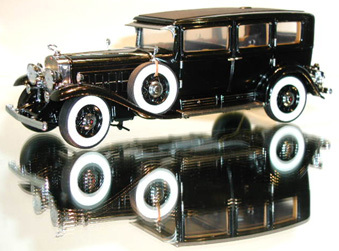 Presented by Franklin Mint Precision Models in association with Cadillac Motor Car Division, this die-cast model is hand-assembled from more than 200 separate parts and packed with authentic working features. It has been re-created in astonishing detail as Scarface's bulletproof "Fortress on Wheels." Al Capone. Scarface. Public Enemy Number One. Born in Brooklyn in 1889, he came to Chicago in 1919, and for the next decade controlled Chicago's racketeering with shrewdness and violence. Although in Miami at the time, Capone was credited with masterminding one of the most notorious mob hits in history - The St. Valentine's Day Massacre - when his men, posing as policemen, machine-gunned down seven members of the "Bugs" Moran mob on February 14, 1929. As Capone's power and influence spread, law officials became increasingly determined to put Capone behind bars. One official, Frank J. Loesch, decided to forgo violence or legal action and instead instituted a device that would bring men like Capone and their activities to light. Loesch's list of twenty-eight Public Enemies was circulated to police chiefs, sheriffs, and law enforcement officers, and was published in the Chicago Tribune on April 24, 1930. At the top of the list - Public Enemy #1 - was Al Capone. During his heyday in the Twenties and Thirties - the target not only of the law but of rival gangs as well - Capone could be seen riding the streets of Chicago in what can only be described as a fortress on wheels. A Cadillac was made to his own specifications and loaded with such "amenities" as bullet-proof glass, custom-designed portholes to accommodate blazing machine guns, boiler-plate panels that made it all but impregnable, a drop pocket under the floor for peppering the road with tacks and a spray gun under the car that would leave an oil slick waiting for pursuing vehicles. Ultimately, Capone was jailed in 1931 for tax evasion. Released in 1939, he settled at his estate near Miami. He died on January 25, 1947. This collection was purchased directly from The Franklin Mint, opened for inspection but never removed from their boxes. Most original tissue and packing materials are intact. The models were then stored in his climate-controlled spare room. Like-new paint as delivered from Franklin Mint. Includes Certificate of Authenticity, blue sheet or how-to-care instructions. Good condition original boxes with some writing on the end flaps. This is a well cared for Franklin Mint collection. Satisfaction Guaranteed!